There is a little land. In that little land, there is a little city. In that city there is a little street, and on that street there is a little wall. When you stand by that Holy Wall, you can hear the footsteps of our father Abraham, and you can hear the trumpet of the Great Day to come. You hear the past and you can hear the future. You can hear the singing of the Levites. Or, you can hear us crying, going into exile. You can hear the six million crying out of the gas chambers, and you can hear the trumpet of the Great Day to come. I was standing one early morning by the Holy Wall and I was saying Kaddish for my father. But when you stand by that Holy Wall, you say Kaddish for the whole world. Sometimes you feel like saying Kaddish for your own soul, and sometimes you feel like saying Kaddish for tomorrow. Then you hear the words “Yisgadal V’yiskadash Shmei Raba — May G-d’s Name become great and sanctified,” and you remember there is one G-d, and you know that the Great Morning is coming. You know that day and night will get together. The living and the dead, we and the whole world. This is my song, the song of tears, because on that Great Day the tears will march through the world, and the whole world will join them. The tears will clear the world and prepare the world. Everything will come together. We will all come together. It will be a new morning — a new beginning. In this remarkable and life-changing work, the reader is transported to the Holy Temple in Jerusalem to be inspired by the teachings of Rabbi Shlomo Carlebach zt”l. 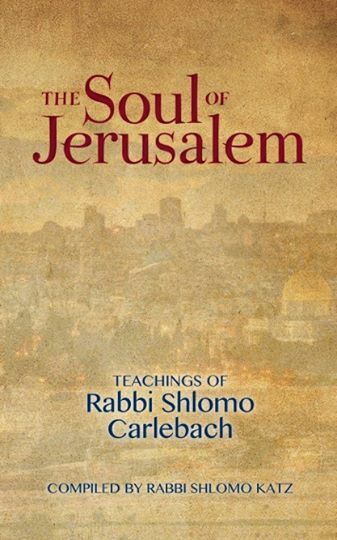 Masterfully adapted by Rabbi Shlomo Katz (renowned musician and creator of the best-selling and acclaimed The Soul of Chanukah: Teachings of Rabbi Shlomo Carlebach), these teachings touch the soul.